Hamilton received a record-setting 16 nominations in 13 categories, ultimately winning 11 total. The revival of The Color Purple won two awards. The Humans won four awards, and the revival productions of plays Long Day's Journey into Night and A View from the Bridge each won two awards. The ceremony received positive reviews. At the 69th Primetime Emmy Awards, it won the Primetime Emmy Award for Outstanding Special Class Program, and was nominated for Outstanding Writing for a Variety Special, Outstanding Technical Direction, Camerawork, Video Control for a Limited Series, Movie, or Special and Outstanding Lighting Design / Lighting Direction for a Variety Special. Shows that opened on Broadway during the 2015–2016 season before April 28, 2016, were eligible for consideration. The Tony Award nominations were announced on May 3, 2016, by Nikki M. James and Andrew Rannells. Hamilton garnered 16 nominations—the most received by any Broadway production to date. Following Hamilton, the season's most-nominated shows included Shuffle Along with 10 nominations and the Roundabout Theatre Company revival of She Loves Me with eight. The revival of Long Day's Journey into Night—also produced by Roundabout—received seven nominations. New plays Eclipsed and The Humans both received six nominations. The 2015–16 season marked the first time since 1960 and the fourth time in history that five shows had been nominated for Best Musical. The annual Meet the Nominees Press Reception took place on May 4, 2016, at the Paramount Hotel. The annual Nominees Luncheon took place on May 19, 2016 at the Paramount Hotel. A toast honoring the season's Creative Arts nominees was held at the Lambs Club on May 24, 2016. A private reception and cocktail party was held on June 6, 2016, at the Paramount Hotel's Diamond Horseshoe to honor the recipients of the season's Tony Honors for Excellence. The ceremony was dedicated in honor of the victims of the 2016 Orlando nightclub shooting, which had occurred earlier that morning. Corden addressed the shooting in a speech at the beginning of the telecast, stating "All we can say is that you are not on your own right now, your tragedy is our tragedy. Theater is a place where every race, creed, sexuality, and gender is equal, is embraced and is loved. Hate will never win." Winners Lin-Manuel Miranda and Frank Langella also addressed the shooting in their acceptance speeches. Miranda read a sonnet that he had written, which included the passage "Love is love is love is love is love is love is love is love; Cannot be killed or swept aside." In respect toward the victims of the shooting, the cast of Hamilton dropped the use of muskets from their performance of "Yorktown (The World Turned Upside Down)" at the ceremony. Emilio Estefan – introduced On Your Feet! Performances that were introduced by individuals who had a relationship with the show included: Steve Martin and Edie Brickell for Bright Star; Oprah Winfrey for The Color Purple; Josh Groban for Fiddler on the Roof; Emilio Estefan for On Your Feet! ; Andrew Lloyd Webber for School of Rock; Meg Ryan for She Loves Me; Marlee Matlin for Spring Awakening; and Keri Russell for Waitress. President Obama and Michelle Obama, in a recorded appearance, spoke of seeing the beginnings of Hamilton at the White House. The ceremony also featured a special tribute performance in honor of the 20-year anniversary of the revival production of the musical Chicago, featuring Bebe Neuwirth and company. The opening number, “That Could Be Me/This Could Be You,” was created by host Corden and Gary Barlow, consisting of snippets from many musicals with Corden and the ensemble replicating shows such as Les Misérables, The Lion King, and ending with 42nd Street. During the ceremony, outside the Beacon Theatre, cast members of nominated shows and other nominees performed brief performance excerpts of iconic shows in the Broadway canon, ranging from The Phantom of the Opera to Annie to Rent. The show closed with the cast of Hamilton performing "The Schuyler Sisters". The 2016 Tony Honors for Excellence were awarded to voice coach Joan Lader, attorney Seth Gelblum, and Sally Ann Parsons, owner of the costume shop Parsons-Meares. Lyricist Sheldon Harnick and Circle Repertory Company founder Marshall W. Mason received Special Tony Awards for Lifetime Achievement. The National Endowment for the Arts and Miles Wilkin, COO and executive vice president of Key Brand Entertainment, received the season's Special Tony Awards. Paper Mill Playhouse in Millburn, New Jersey received the Regional Theatre Tony Award. Brian Stokes Mitchell was named as recipient of the Isabelle Stevenson Award for his work with the Actors Fund. The season's Excellence in Theatre Education Award was awarded to drama teacher Marilyn McCormick of Cass Technical High School in Detroit. Michael Shannon – Long Day's Journey into Night as James Tyrone, Jr.
Sergio Trujillo – On Your Feet! ‡ The award is presented to the producer(s) of the musical or play. The show received a positive reception from media publications. Some media outlets received the broadcast more positively with praise directed toward host Corden and how he dealt with the Orlando nightclub shooting. The Hollywood Reporter columnist David Rooney remarked, "In terms of Corden's overall performance as host, it was very much in line with his Late Late Show monologues — sweet and upbeat, if not the least bit risky or cutting-edge. Despite the inevitable longueurs that set in as the evening wore on, for the most part he kept the show moving briskly with affable appearances to paper the gaps." Television critic Robert Lloyd of the Los Angeles Times remarked, "Where Neil Patrick Harris, who once seemed to have permanent first-refusal rights on the job, is a cool cat, Corden is a ball of energy, a big dog that won't stop licking your face; but it is a style that works for him." The New York Times theatre critic Charles Isherwood commented, "Was a bit jarring moving to comedy, but Mr. Corden is such a genial presence." In addition, Maureen Ryan from Variety wrote, "Corden was an energetic host, even if the opening number meant to showcase his lifelong love of theater felt as though it went on a little long. There was also the inevitable Carpool Karaoke number. Corden was an affable host, and his opening remarks on Orlando were short but effective." Frazier Moore of the Rolling Stone wrote, "On a night that was marked by tragedy — and occurring mere hours after news broke of the deadly mass shooting in Orlando, Florida — the Tonys provided a much-needed bit of levity. The performers and honorees didn't shy away from speaking about the shocking events of the day, but the overall mood was one of celebration. Part of the credit goes to the master of ceremonies James Corden, best known as the goofy host CBS's Late Late Show, yet still a dorky theater kid at heart; his charming, cheerful persona brought an upbeat mood to the proceedings." The Washington Post theatre critic Peter Marks gave high marks toward Corden saying, "Corden served for the first time Sunday night as host of the Tony Awards and, as a result, ushered in a completely pleasurable Era of Good Feeling for an awards ceremony, and an industry, badly in need of one." The ceremony averaged a Nielsen 6.8 ratings/11 share, and was watched by 8.7 million viewers. The ratings was a 33 percent increase from previous ceremony's viewership of 6.4 million, becoming the highest rating in over 15 years. An orchestra was performing in the tribute as images of theatre personalities who died in the past year were shown in the following order. ^ a b c Paulson, Michael (May 3, 2016). "the hip-hop musical about America's first Treasury secretary". New York Times. Retrieved 13 June 2016. ^ Ungerman‍, Alex. "Emmys 2017: The Complete Winners List" MSN.com, September 18, 2017. ^ Ehrbar, Ned. "Tony Awards 2016: James Corden opens the show with a touching tribute to Orlando". CBS News. Retrieved 13 June 2016. ^ Wilson, Grace. "Watch Lin-Manuel Miranda's powerful Orlando tribute at the Tony Awards". Mother Jones. Retrieved 13 June 2016. ^ "Tonys: "Hamilton" drops muskets from awards show performance". CBS News. Retrieved 13 June 2016. ^ "Tony awards 2016 - complete list of winners". Guardian. 12 June 2016. Retrieved 14 June 2016. ^ Rooney, David (June 12, 2016). "The 70th Annual Academy Awards: TV Review". The Hollywood Reporter. Archived from the original on June 13, 2016. Retrieved June 13, 2016. ^ Lloyd, Robert (June 13, 2016). "The sincere and real Tony Awards rebuke the Orlando shooting with laughs, music and love". Los Angeles Times. Archived from the original on June 13, 2016. Retrieved June 13, 2016. ^ Isherwood, Charles (June 12, 2016). "Highlights and Analysis of the 2016 Tony Awards". The New York Times. Archived from the original on June 13, 2016. Retrieved June 13, 2016. ^ Ryan, Maureen (June 12, 2016). "TV Review: 'The 70th Annual Tony Awards'". Variety. Archived from the original on June 13, 2016. Retrieved June 13, 2016. ^ Reilly, Phoebe; Plitt, Amy (June 13, 2016). "20 Best, Worst and WTF Moments at 2016 Tony Awards". Rolling Stone. Archived from the original on June 13, 2016. Retrieved June 13, 2016. ^ Marks, Peter (June 13, 2016). "Critic's Notebook: Miranda's big night, and Corden's larger truths". The Washington Post. Archived from the original on June 13, 2016. Retrieved June 13, 2016. ^ Laura Prudom (June 13, 2016). "Tony Awards Hit Highest Overnight Rating in 15 Years". Variety. Retrieved June 14, 2016. ^ Dominic Patten (June 13, 2016). 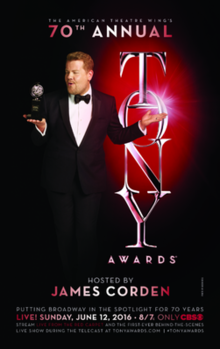 "Tony Awards Viewership Rises To 15-Year High, Stanley Cup Finals Down From 2015 – UPDATE". Deadline. Retrieved June 13, 2016. ^ Tom Huddleston Jr. (June 13, 2016). "Tony Awards Ratings Highest in 15 Years, Thanks to 'Hamilton'". Fortune. Retrieved June 14, 2016. ^ BWW News Desk (June 12, 2016). "VIDEO: Alan Rickman & More Honored in the 2016 TONY AWARDS In Memoriam". Broadway Worldwide.